Trace Format Some traces are Legacy POS, others are ERF. Snapping Method Fixed length capture: 64 bytes for Legacy POS traces, 54 bytes for ERF. Rotation Policy Trace files were rotated on 6 hourly boundaries, based on the start of the day. Anonymization IP addresses replaced using one-to-one mapping into 10.0.0.0/8 address space. Any payload beyond the transport header has been replaced with zeroes. This is a continuous short capture taken from the University of Leipzig Internet access link. A pair of DAG 3 cards were used to monitor the OC3 Packet-over-Sonet connection to the German research network (G-WiN). 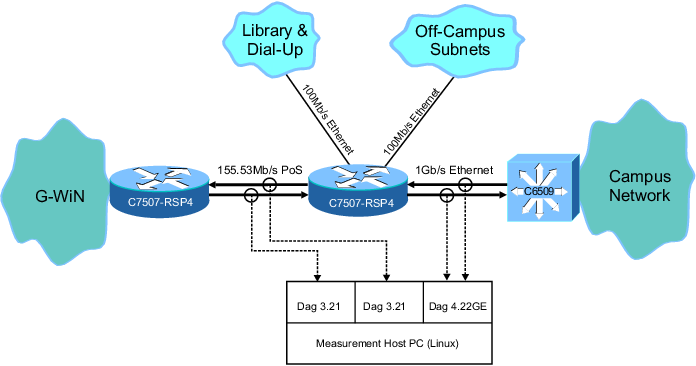 Also, a DAG 4.2GE card was used to monitor the 1000BaseSX link to the central campus switch. A diagram of the capture configuration can be found here. Each trace file is named using the following format: yyyymmdd-HHMMSS-[source].gz. The time and date refers to the local time when the capture was started. The source refers to the interface that was used to capture the traffic. A source of 0 or 1 indicates that the trace is a legacy POS trace. Each legacy POS trace only contains either incoming or outgoing traffic for the University; both traces must be combined to create a bidirectional trace. If the source is 'e', then the trace was captured via an Ethernet interface and is in the ERF format. The ERF traces are bidirectional. All non-IP traffic has been discarded and only TCP, UDP and ICMP traffic is present in each trace. Any user payload within the capture record has been zeroed. The IP addresses in the traces have been replaced using a one-to-one mapping into the 10.0.0.0/8 address space. Each anonymised address was assigned sequentially so the first real-world address observed is mapped to 10.0.0.1, the next new address is 10.0.0.2 and so on. The mapping database was preserved across the entire trace set. Acknowledgements: Some of the information presented on this page has been sourced from the NLANR page about this trace, which no longer exists.